Oxford University remains "a bastion of white, middleclass, Southern privilege" after "glacial" progress on improving diversity, David Lammy has said. The Labour MP told the BBC the university was "failing badly".His comments came as Oxford University data revealed about a third of its colleges accepted three or fewer black applicants, in the past three years. The university said it was "not getting the right number of black people with the talent to apply".Director of undergraduate admissions Dr Samina Khan told the BBC she was "pushing hard" on outreach activity to make sure those students felt welcome. Oxford's annual admissions report showed 11% of last year's undergraduates were from disadvantaged backgrounds. The proportion of students identifying as black and minority ethnic was 18% in 2017, up from 14% in 2013.One college, Corpus Christi, admitted just one black student resident in the UK in its 2015-2017 intakes.The number of admissions from state schools, during the same period, rose by 1%, from 57% to 58%. The report also showed a divide between the north and south of the UK. London and the South East made up 46.7% of UK applications between 2015 and 2017, (and 47.9% of students admitted) while the North East accounted for just 2% (2.3% admitted).Speaking to Radio 4's Today programme, Mr Lammy said the university had to explain why - having looked at the data - a person was twice as likely to get in if they were white, not black. 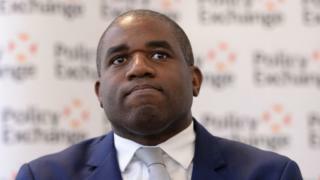 Mr Lammy previously accused the university of "social apartheid", after a Freedom of Information request by him revealed 10 out of 32 Oxford colleges did not award a place to any black British pupil with A-levels in 2015.This prompted more than 100 MPs to write to Oxford and Cambridge urging the universities to recruit more students from disadvantaged and under-represented backgrounds.Reacting to the latest figures, Mr Lammy said the problem was "self-perpetuating". "If you're on the 20th floor of a tower block estate and you're getting straight A's, you apply, go for a difficult interview.. you don't get in, then none of the other kids apply the following year." "It's very elitist, very, very white," student Taiwo Oyebola said. "For me, applying for Classics, I was very aware I'd be the only black person or one of a few people of colour." "We have this joke in lectures, I go in and there's this group we call them the Eton row, because all the Eton boys sit there." Joshua Tulloch of the Oxford African and Caribbean students society said his organisation was involved in targeting younger black students. "We have a vast access infrastructure which targets students from as young as Year 9," he said. "The university is supporting us in making sure that we are visible and people can see that they can succeed in Oxford. "Oxford has said it must do more to attract talent from all backgrounds. "We want a diverse university," Dr Samina Khan told Radio 4.The university has agreed to a scheme which would fund the interview travel fees of applicants from disadvantaged backgrounds. It said it is doubling its spring and summer schools, which work with students from under-represented backgrounds.